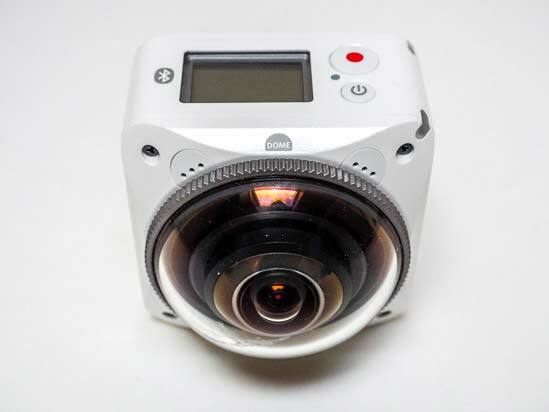 The Kodak Pixpro 4KVR360 is a new action camera which, as the name suggests, can record 360 degree photos and videos. 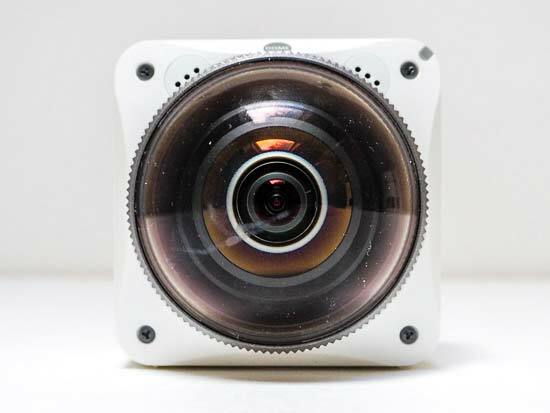 Two dome-shaped lenses (197 degree and 235 degree) capture an entire 360 degree view, and video can be recorded in 4K quality. 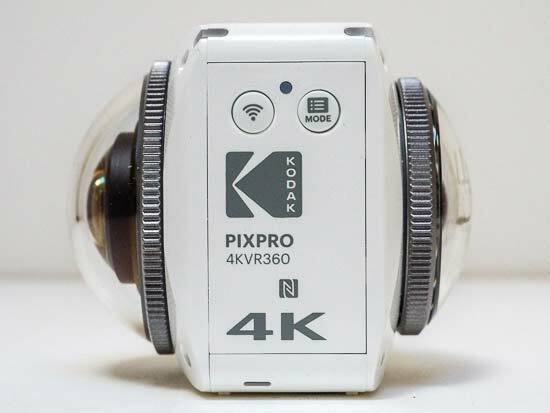 The Kodak Pixpro 4KVR360 also features dual 20 megapixel CMOS sensors, Wi-Fi, Bluetooth and NFC connectivity, and is waterproof to a depth of 60m using the supplied housing. The Kodak Pixpro 4KVR360 retails for $499 / £399. Following on from the original Full HD video-shooting Kodak SP360 camera back in 2014 and its successor in the SP360-4K, which shot 4K-video or 2028x2028 pixels at up to 50fps and we reviewed last year, we now get the catch-all latest generation Kodak 4KVR360, again produced by Kodak license holders JK Imaging Ltd. UK retail price at the time of writing for this palm-sized gadget was £399.99. Another defiantly ‘boxy’ unit, which, thanks to its glossy white shell, recalls a piece of sci-fi set design from 2001: A Space Odyssey or the original Star Wars, we have to admit that it is pretty eye catching. However the ‘Pixpro’ 4KVR360 differs in appearance from previous iterations in being bookended by not one but two fixed focus lenses, thereby allowing the user to capture a full 360° sphere around them. As before, this means that it can be panned vertically, horizontally, diagonally, or however the user wishes, so as order to achieve multiple vantage points on playback. Other available angles of view this time around are 155° or 235°, dependent on which of its two lenses has been selected via its rudimentary menu system and is being utilised at the time. More on this later. As its model name suggests, the 4KVR360 offers up to 4K Ultra HD recording, and, if the 360° VR mode is selected, up to 27 megapixel stills (as opposed to a maximum 8 megapixel photos via the prior SP360-4K unit) plus up to two hours recording time. If instead selecting the ‘front’ lens mode (providing 155° viewing angle) then 8MP is still the fall back for this camera. Obviously because this produces results that are less fisheye-like and distorted than the wider views provided by the other two selectable modes, it’s the dimension that most closely resembles a standard wide angle still from a more conventional camera and lens. Dimensions of the 4KVR360 are a tight, palm-sized 55x55x66.9mm and it weighs an unobtrusively manageable 170g with battery and card loaded. 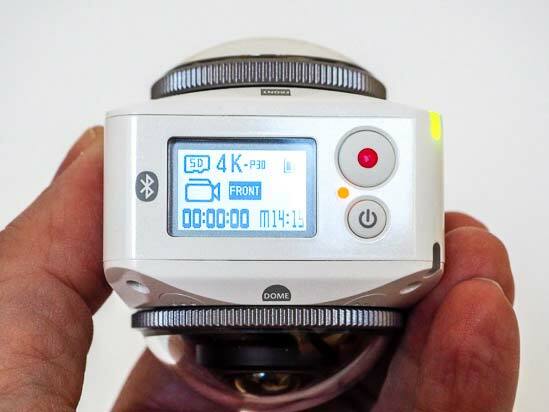 As well as enabling it to be conveniently dropped into a bag or jacket pocket, the diminutive dimensions also make this an option for a dashcam or security camera of some sort, as well as being something to record more active (and potentially more photogenic) thrills and spills. Designed for ‘shoot and share’ operation, as with prior generations of this Wi-Fi enabled device, we get a small one-inch digital watch-type LCD window (which is backlit) via which to navigate the cameras settings, in combination with four small physical buttons that at times double up with regard to their functionality. As one would expect, in terms of connectivity as with its forebear there’s the ability to download an app for your iOS or Android phone or tablet to connect wirelessly between the action cam and your ‘smart’ device for remote viewing, though, apart from its core settings, functionality remains fairly basic. As regards the multi-use aspect of the key controls on the unit itself, this can make for slightly confusing and fiddly operation, as you try and remember how you made a particular selection and then later, how to alter it again. There’s no luxury of more expansive drop down menus here, or even a ‘back’ button, as on a regular digital camera, to enable the re-tracing of steps. Thus, unless you want to implement a particular setting and leave it at that more or less permanently, this Kodak feels less intuitive to use than it might be. You’ll need to set aside a bit of time and summon up reserves of patience in the first instance, though we did find that we very slowly ‘clicked’ with the camera over time (no pun intended). And, because it’s been engineered to be used for action-packed stills or video shooting scenarios – not being able to get away to the alps, we took it ice-skating – the unit has obviously been constructed to be sleek and unobtrusive, and that necessarily means a frill-free, minimalist design. Writing to optional microSD card (with support provided for Class 10 or Higher cards, up to a capacity of 128GB), with a slot provided for its insertion at the side of the unit – a compartment that also houses its removable lithium ion battery - the two lenses (as mentioned) are complemented by dual 20 megapixel CMOS sensors. Both sensors (A and B) offer 20.68 effective megapixels from 21.14 megapixel 1/2.3-inch backside-illuminated CMOS chips. Both lenses deliver a maximum f/2.4 aperture, which feels sufficiently bright/fast for general use and non-specific purpose. Focusing range is a standard 30cm to infinity (an improvement over its forebear’s 50cm closest focusing range). Given its small size, it’s no surprise to learn that the Kodak’s image stabilisation system is electronic rather than sensor or optically based. Light sensitivity runs from ISO100 to 3200. You’ve either got the choice of shooting with lens B which offers a spherical dome-like 235° field of view, or lens A which offers a wide angle 155° - both views obviously produce a curvature of the image. 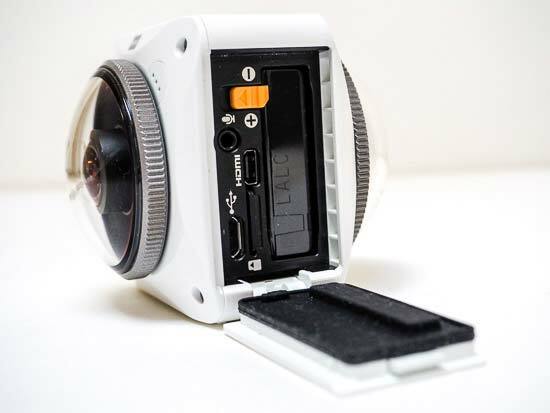 If you want to go all in and get the full 360° spherical image, then VR mode combines the output from both lenses to produce the one image; so in essence we’re getting the choice of three points of view – a veritable triple whammy of options. Looking at the device itself, the top plate – or operational end - features the aforementioned small LCD window for displaying and allowing the navigation of its stills and video capture options, next to which is a small power button requiring a fingertip press to activate (or deactivate), whilst a second larger ‘record’ button acts as the shutter release when taking stills, or, alternatively, the record button for filming video. With the camera facing the direction marked ‘front’ at its topper-most edge, the right hand flank of the unit features a mode button and a second one for activating Wi-Fi, again both pretty small and of the same size as the power control. Once the ‘mode’ button is held down for a couple of seconds thereby enabling that self-same function to become ‘active’, these two buttons provide a way of tabbing left and right (or up and down) through on-screen selections, which are then implemented with a press of the red record button on the camera’s top plate. Menus are brief, basic and icon-led. As with the thin and diminutive LCD window itself, think 1980s digital watch in terms of sophistication/straightforward-ness. Due to the paucity of controls and generally frill free design and operation, we had to remember which direction to scroll through the menus – represented on-screen one icon at a time – to find what we wanted, and weren’t always successful. Indicator lights placed on the top right corner of the device – so in between the two sets of buttons as described, illuminate and blink when the Kodak is in operation. It is fairly responsive, albeit fiddly to use as discussed. The other, left hand side, of the unit, is where we gain access to the removable lithium ion battery (a charger and mains plug was provided in our package) an HDMI port, a USB port, a microphone port and also a slot for the optional (yet essential) microSD card. We found it quite fiddly to remove the battery, as there isn’t really enough room between the internal ‘walls’ of the unit to be able to get a decent purchase on it with your fingers in a pinching action – resulting in us having to gently shake it free to be able to recharge it. The microSD as a format is naturally fiddly to insert and retrieve, because of its small size, but, on a practical note, most folks looking to purchase this Kodak will of course have similar cards in their mobile phones. The base of the camera meanwhile features a standard screw thread, for attaching it to the robustly built mini tripod provided out of the box. Also included in said box are a tiny remote, protective rubber covers/caps for the lenses that resembles a squash ball sliced in half, along with a microfibre cleaning cloth, plus Quick Start Guide. It’s worth using the slip-on rubber lens protectors too, as we managed to scuff the plastic domes outwardly protecting both lenses over a couple of months of use. This led to a hazed effect with regard to our images, as though they’d been smeared with grease, where daylight caught said scuffs. Luckily said domes can be unscrewed to reveal the naked lenses beneath, and thus we were able to avoid this hampering, or indeed completely scuppering, progress. JK Imaging might want to throw a couple of spare protective domes into the box therefore. Protective plastic aside the unit also feels solid held in the palm. Grasp it firmly and there’s no give to the bodywork. So what of the imagery achievable by the Kodak 4KVR360? Is it a case of this being an elaborate toy or a realistic tool for those who seek to create imagery that is literally all enveloping? Click forward to the next section to find out.